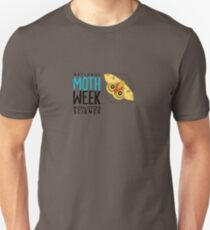 Each year, NMW highlights a different group of moths to encourage moth-ers to record and photograph them in their local habitats. Found around the world, Geometridae comprise one of the largest families in the Lepidoptera order and often are called geometers and “geos.” Their name comes from Ancient Greek: geo, for “earth,” and metron, “to measure,” referring to their larvae, or caterpillars that appear to measure their movements across leaves and earth – think inchworms and loopers. For moth-watchers, geometers can be fascinating to find and photograph at a moth night for their interesting colors and patterns. The moths usually lie flat when they land rather than folding their wings as other moths do. The males’ antennae are often feathered. They are modestly sized – just over an inch – and their colors and patterns can be quite exotic. Studying moths can be as easy as turning on a porch light and waiting for them to come, or shining a light on a white sheet in a backyard or park. Ambitious moth-ers also coat tree trunks with a sticky, sweet mixture of fruit and stale beer. Searching for caterpillars and day-flying moths is a good activity for daytime. 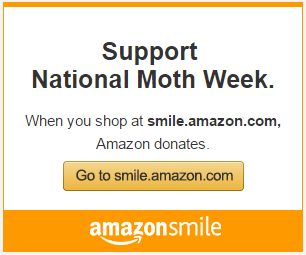 The NMW website offers tips on attracting moths. 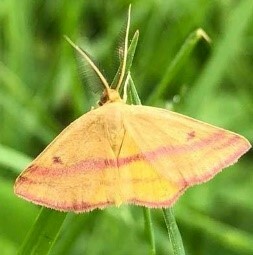 Photo: Chickweed Geometer, Upper Freehold, NJ, by Dave Moskowitz.